Dee White, Member Services Representative, is remembered. The SC/TA staff thanks all of you for the expressions of sympathy expressed for the loss of our colleague and friend, Dee White. As many of you know, Dee was tough. What you may not know is her funny side and sense of humor. She was always willing to take part in a joke (especially on Barry), and we loved to tease her to get her response. We will miss that. The other thing you probably do not know is her love of animals. I truly believe she loved animals more than anything in the world. On many occasions, I would watch her down on her knees, trying to rescue the tiniest of lizards and put it outside. 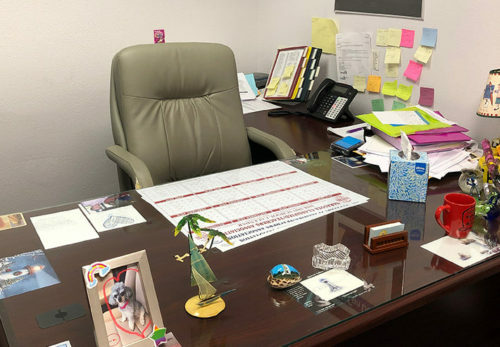 Dee White’s office Monday afternoon. Dee did not want a memorial service. Many of you have asked about making donations in Dee’s name. We’ve decided that anyone making a donation in her name to the Humane Society would make her smile. Dee worked very hard, and she helped a lot of our members over the years. She was there for me whenever I needed her. She loved to torture Ellery and Lou. She was always the first one here in the morning, and yesterday she was not.